REVIEW – Drones are all the rage today, and they have become significantly more complex and feature-rich. 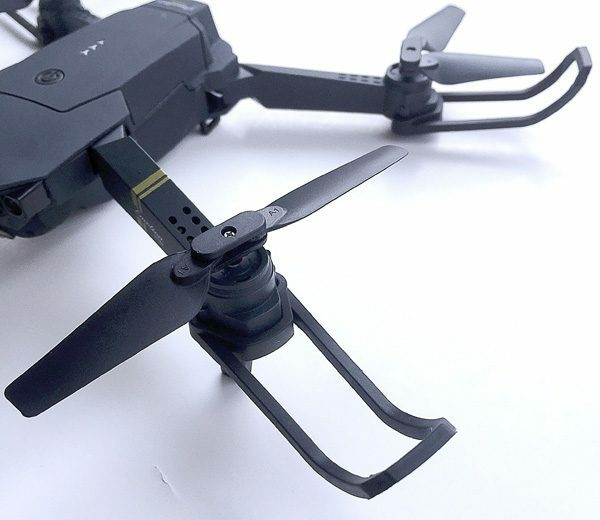 While high-end drones like the DJI Mavic Pro are capable of all sorts of aerobatics and videography, not everyone can afford one, so there is a large and growing market for less expensive drones that are still fun to fly and provide many of the features of their higher-end cousins. 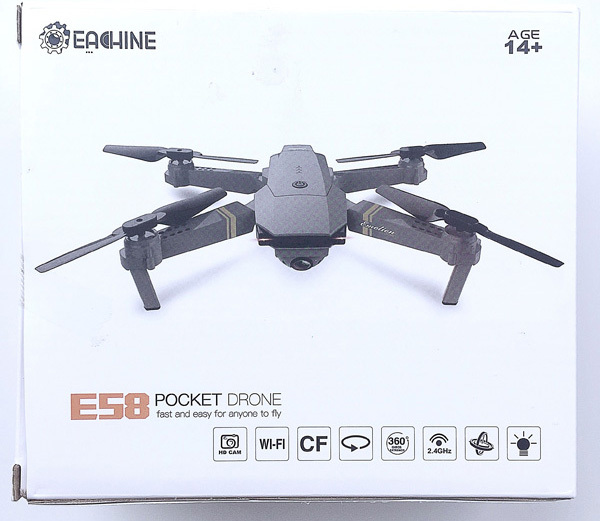 One such product is the Eachine E58 RC Pocket Quadcopter Drone. 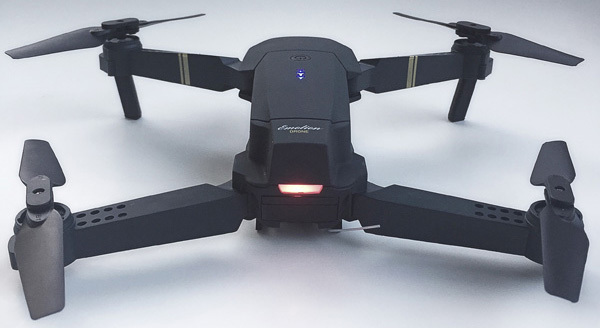 While it is basically a smaller version of the granddaddy Mavic Pro, it is still loaded with features while being significantly more affordable. Let’s check it out! Gadget on! 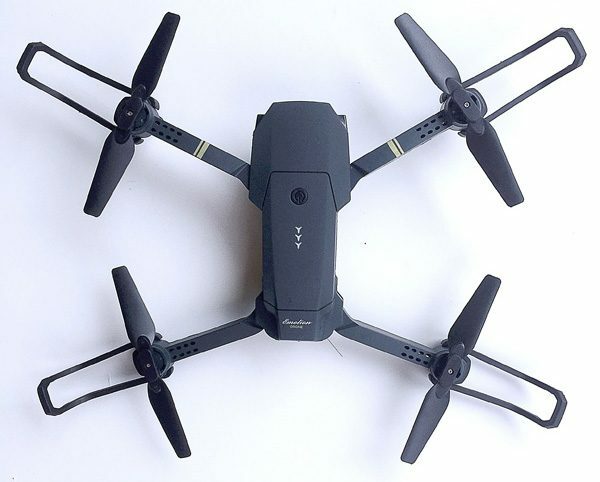 The Eachine E85 Quadcopter Drone is a small, foldable, radio-controlled drone that is styled to be, in appearance and essential functions at least, a miniature version of the larger and much more expensive DJI Mavic Pro drone. 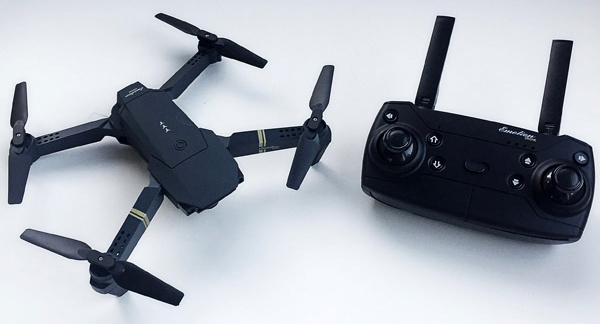 So it is basically a drone clone (see what I did there?). My first impression of the E58 was that is was very small and compact when folded down. Smaller than I had imagined, actually, and because of this it seemed very portable and easy to take with you. In fact, the E58 is small enough to almost fit in the palm of my hand, and is very lightweight. 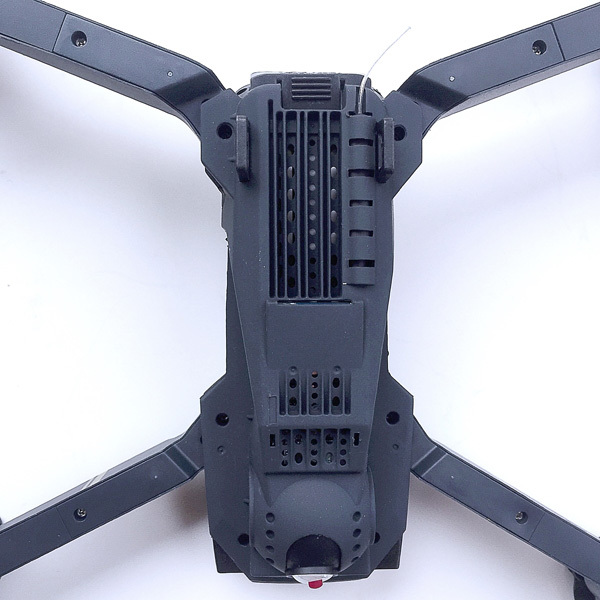 However, even when folded down it actually feels fairly solid, like it isn’t going to just fall apart on you if you bump it against something, the way a lot of drones feel to me. It would be easy enough to place it into a backpack or other bag for transport, but I think it might get banged up quite a bit if it were not put into some type of case first—do a Google search for “E58 drone case” and you may find some good options for this. 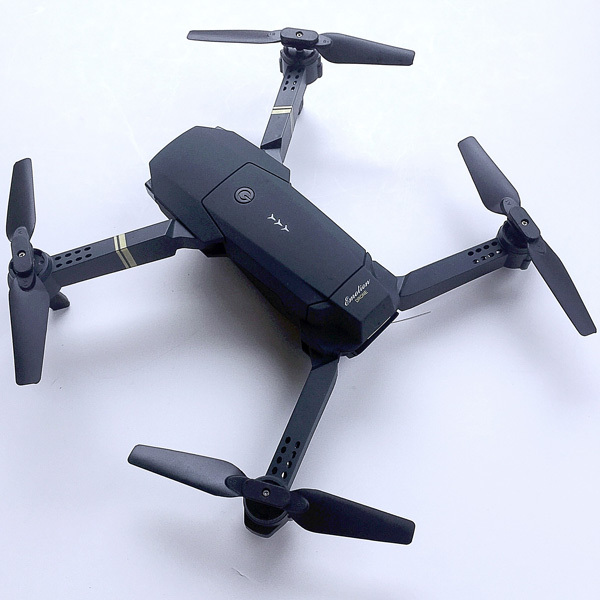 After folding out the E58’s four legs, my very next impression was that, in appearance, it is truly a clone of the DJI Mavic Pro quadcopter drone, which is one of the current granddaddies of high-end drones. The E58 is basically a nearly exact copy in appearance but in miniature. 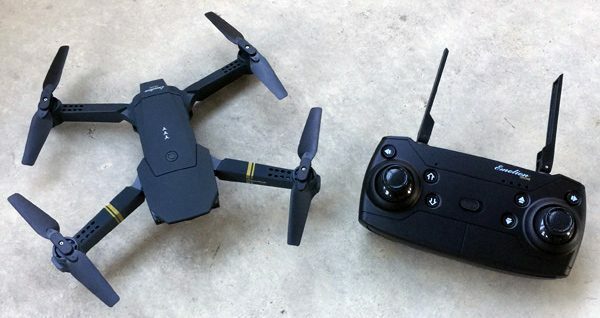 I don’t think this is a bad thing at all; I really like the low-profile, futuristic the styling of the Mavic Pro myself, and Eachine did a really solid job of mimicking the Mavic Pro’s Styling for their E58. Above, another view of the E58 with its “arms” fully extended. Each of the props is labeled “A” or “B” and each must be installed on the correct legs of the E58, or the drone will not fly optimally (if at all). In addition, the E58 includes four “bumpers” that can be attached to each leg to protect the props. As a fairly new drone pilot, I installed these on the E58 before I took it out for its first test flight, as seen in the above image. In fact, these bumpers saved the E58 from my flight control learning curve multiple times, as I seemed to repeatedly find items in my yard to collide with. To me, the “front” of the E58 almost appears to be a “face” as seen above. 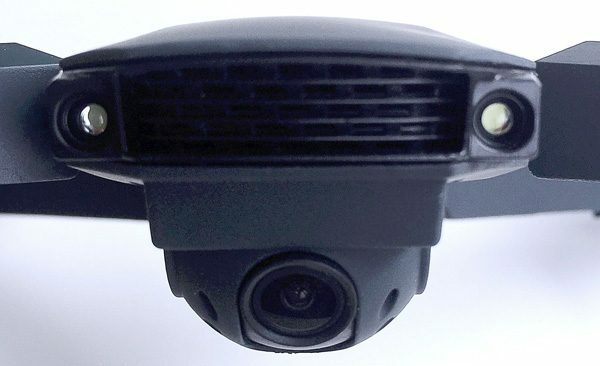 There are two lights on either side of a grille, with the E58’s camera mounted at the “chin” position. 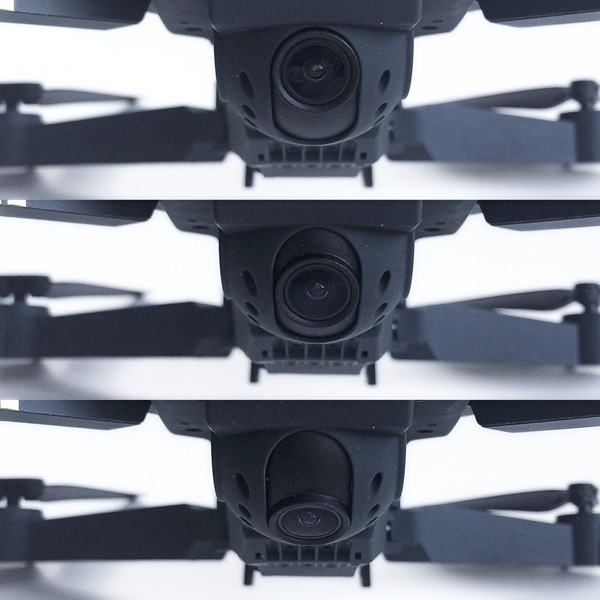 The E58’s camera is mounted on pivot that, although it does not move side-to-side, can be manually positioned from zero degrees (straight forward) to 90 degrees (straight down) prior to flight, as shown above, and it slides smoothly along its track, not in discreet stopping points. The camera has a glass lens for clarity and friction seems to hold its position in place once set, even during crashes. Pressing the power button on the top of the E58 turns it on. As seen in the image above, there is a column of three blue LED lights on the top of the E58’s fuselage that to me resemble the logo of the popular game “Destiny.” (Probably a coincidence, but still fun.) In any event, these three LEDs are not battery power level indicators as you might expect; they merely indicate when the E58 is powered on. As mentioned above, the E58 has a pair of white lights on the front that, when illuminated, appear to almost be headlights, as seen in the image above. Having two headlights on the front can help with visually determining orientation of the E58 in lower-light flying conditions. In addition to the “headlights” on the front, the rear of the E58 includes a single red light bar that resembled as car’s tail light, as seen in the image above. Again, this light on the rear can help in visually determining the flight orientation of the E58. Let’s take a look at the underside of the E58. As seen in the image above, a small antenna that resembles a short length of fishing line protrudes from the back end of the drone. Also, you can see some of the electronic innards of the E58, visible through the slats of a grille on its underbelly. There are several sets of grilles and holes around and on the E58’s underside, presumably to allow heat to escape during flight, since I did notice that the E58 gets quite warm after only a few minutes of operation. Another feature located on the underside of the E58 is the Micro SD card slot, which is spring-loaded so the card “clicks” in place when pressed in and “clicks” back out when pressed again. The E58’s video and still camera can record to this Micro SD card during flight. The drone can record 720p onboard to this card. Note that a Micro SD card is not included, you must supply your own. 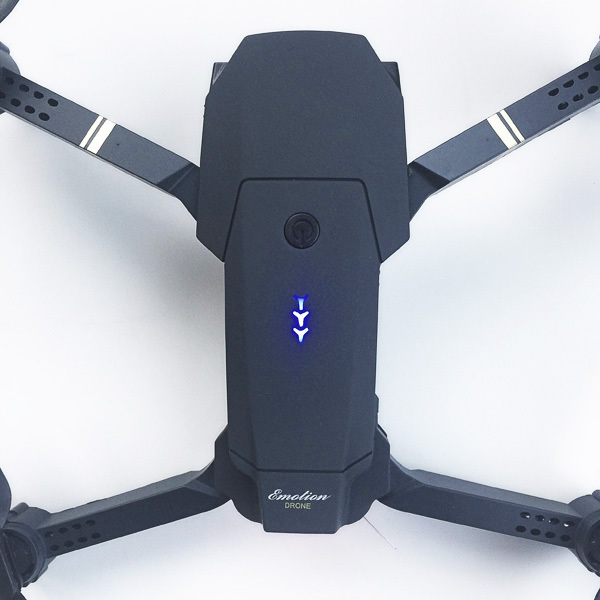 The E58 is powered by a single, rechargeable 3.75V battery that slides into a slot in the back of the drone, as seen in the image above. 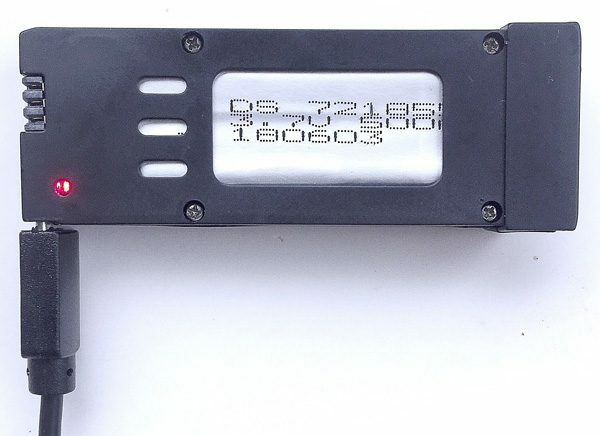 This battery is charged by simply plugging in the included micro USB cable, as seen in the image above. 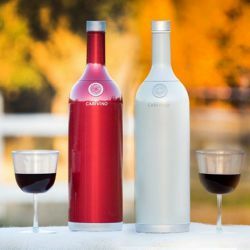 When charging, a small red LED is illuminated, which turns off when the battery is fully charged, which is typically about an hour if it has been fully drained. Next, let’s check out the E85’s controller. As seen in the image above, it has two joysticks and multiple buttons that are all used to control various features of the E58 during flight. It resembles the styling of the DJI Mavic Pro drone’s controller as well, which I suspect is not a coincidence. The controller has two collapsible “antennae,” that appear to be for styling purposes only and not for any sort of actual function. 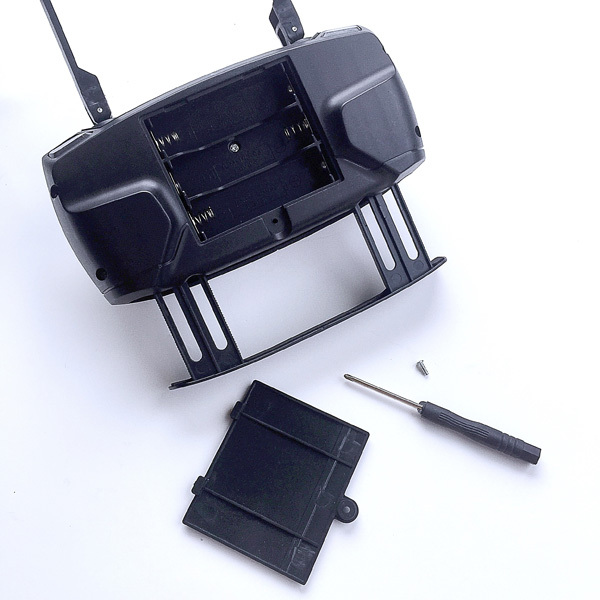 In addition, the controller has a hidden tray that slides out from the bottom and can be used to mount a smartphone (more on this below). The controller’s smartphone tray held a phone as large as an iPhone 6 Plus, as shown above; however, this seemed to be putting quite a bit of strain on the tray and I wouldn’t recommend placing a phone quite this wide here. 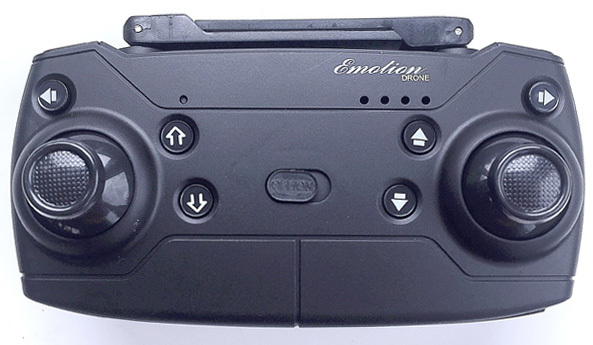 The E58’s controller is powered by three (3) AA batteries, which are not included. 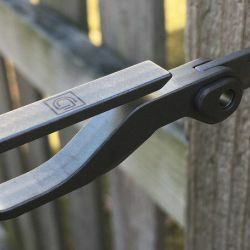 However, a small screwdriver is included, which facilitates removal of the tiny screw that holds the battery cover in place, as seen in the image above. Just be sure not to lose that screw, or you’ll be screwed (pun intended). Sliding the On/Off switch in the center of the E58’s controller powers it on, which is indicated by the illumination of a small blue LED, as seen in the image above. As with the E58 drone itself, this LED appears to be in a bank of four that would seem to indicate the controller battery’s power level, but this does not seem to actually be the case; only the second LED from left is ever illuminated and this did not ever seem to change no matter the controller’s remaining power level. Let’s take a look at the controls, starting with the front face of the controller. The left joystick controls the throttle; forward on the stick is increased throttle, backward on the stick is decreased throttle. Letting go of the stick allows it to center itself. 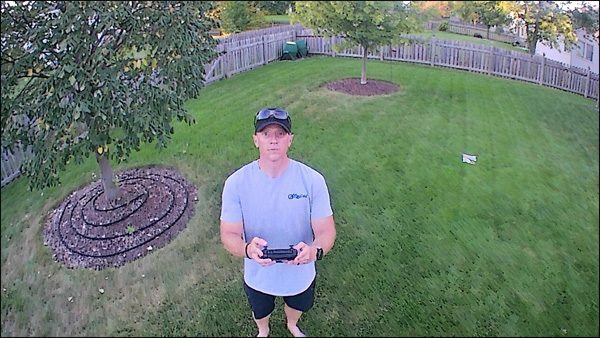 Pushing the stick right or left will rotate or “yaw” the drone about its vertical center axis in that direction. 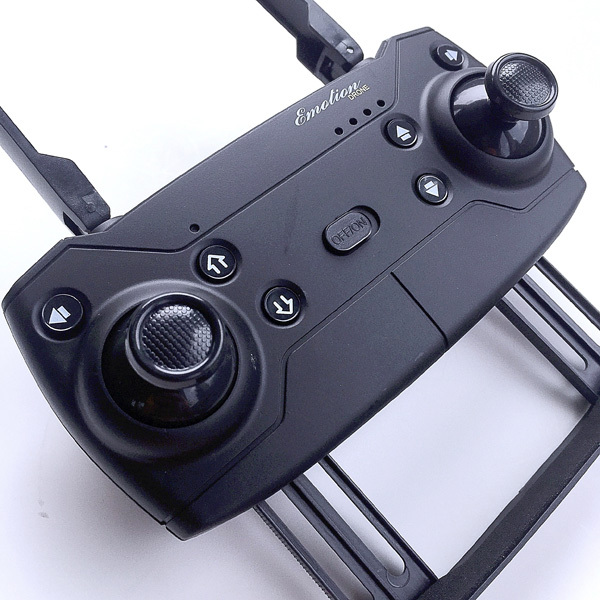 Pushing the right joystick up or down controls the forward and reverse motion of the drone, while pushing the right side stick right or left “slides” the drone laterally in that direction. One other feature of the joysticks is that the E58 can be calibrated by pushing both joysticks down and to the right. The arrow buttons in the upper left and upper right of the controller are the fine tuning left and right controls. The hollow up and down arrow buttons to the left of the on/off switch are the one-touch launch and one touch land buttons. 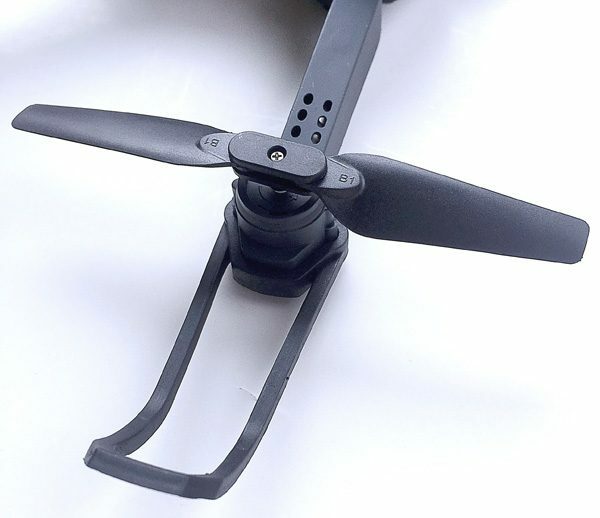 The one-touch launch button starts the motors and immediately launches the drone into the air, while the one-touch land button brings the drone down to the ground fairly gently, then kills the motors. The solid up and down arrow buttons to the right of the on/off switch are the fine tuning forward and backward controls. Next let’s look at the four buttons on top of the controller, as seen in the image above. Starting from the left side, the button in the upper left, farthest from the front of the controller, operates the “Headless Mode” (a short press) and One-Key Return (a longer press). 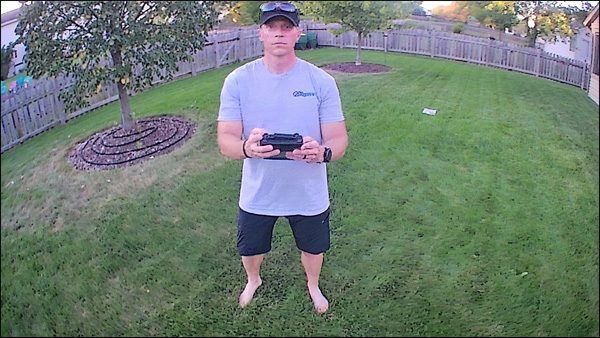 The Headless Mode essentially make the drone fly as if the controller is its reference point; I found this mode to be difficult to adjust to. The One-Key Return was a bit dodgy. Because this is a lower-end drone without the GPS capability of the higher-end drones, this “return” function does not work as well as you might expect. It basically turns the drone around to a heading that is pointing toward you, but you have to actually fly it back to your location yourself; it does not fly itself to you. The button in the lower left, closest to the front of the controller, is the Photo/Video button, though this button never did seem to work; I had to control the still and video camera features with the app on an iPhone (see more on this below). Moving to the right side, the button in the upper right, farthest from the front of the controller, operates the “360 Flip” (a short press) and Emergency Stop (a longer press). The 360 Flip is fun; you press the button, then press the right joystick left or right to force the ED58 to flip in that direction. Also, be very careful with the Emergency Stop—it kills all of the motors immediately and the drone drops to the ground like a rock, which could be very damaging if the drone is at high altitude and drops onto a hard surface (fortunately I only tried the E58 on grass). The button in the lower right, closest to the front of the controller, is the Speed Switch. This cycles the drone from 30% to 60% to 100% then back to 30% speed level with each press. 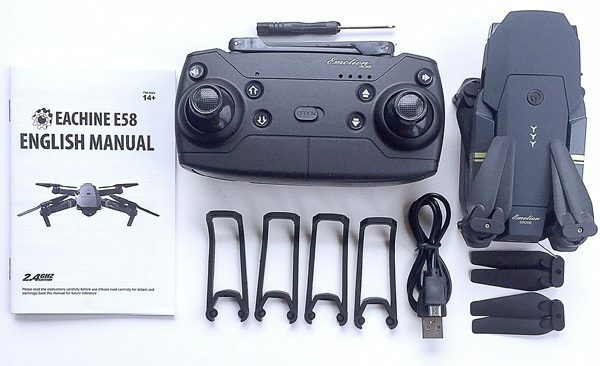 As a neophyte drone pilot, I kept the E58 in 30% most of the time while I acclimated to the controls, but I can tell you that the 60% and 100% speed rate settings are quite fast and experienced pilots will really like them. Next, I tried controlling the E58 via app. Eachine recommends an app called “JY UFO” which I downloaded for free from the iOS App Store. 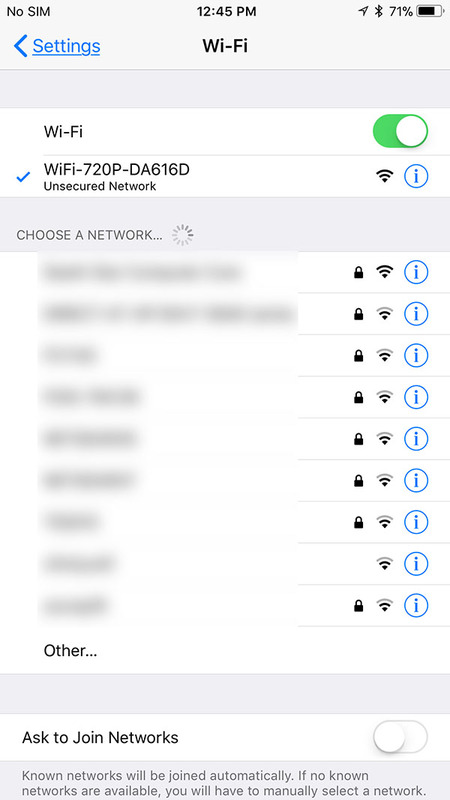 Since the E85 has WiFi capability and essentially projects a mini Wi-Fi hotspot, I followed the instructions on the app and connected the drone to the iPhone by going to Setting on the iPhone, then Wi-Fi, then selected a signal called “WiFi-720P-DA616D,” seen above. This essentially connected the iPhone to the E58 just as if it were a WiFi router; however, this is really only a link between the E58 and my iPhone, with no actual internet access and no data roaming, so you don’t need to be in range of an actual WiFi router to make this work. I then re-launched the JY UFO app and started playing around with the controls. The above image depicts what I saw on the JY UFO app. 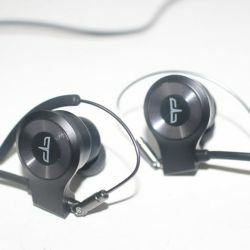 The background of the app is what the E58’s camera is “seeing” at any given moment. The left and right joysticks, as well as other controls, are simulated on the app’s screen. 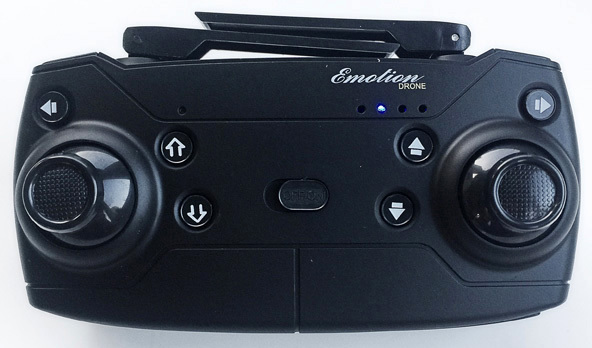 In addition, the app allows the E58 to be controlled in gyro mode, which bypassed the simulated joysticks on the screen and lets you control the flight attitude of the E58 by tilting and tipping it. However, I found this to be quite challenging (I probably need a lot more practice on this). Yet another method of controlling the E58 with the app is “Mission Planner” mode, in which you trace a trajectory on the app’s screen, then the app directs the E58 to fly in that trajectory. I didn’t find this mode of controlling to be all that accurate or useful. 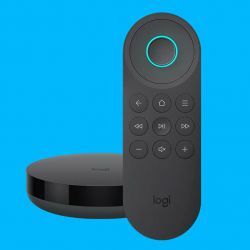 Of particular interest is that, as mentioned above, I could only control the still and video recording features using the app, not the controller. Using the JY UFO app allowed me to record both images and video in 1280×720 resolution; the still images were stored in my iPhone’s Photos, while the video was stored on the Micro SD card. The images had a bit of a “fisheye” effect, but the video footage did not. Although I found the E58’s dedicated controller a but easier to learn, I liked having the flexibility to control it with the app instead; this way, if I wanted to leave the controller behind to save space, I always have my phone with me as a controller. I flew it over my roof a bit. 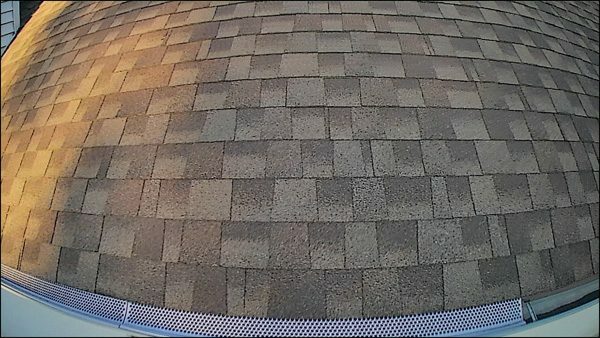 I could envision using the E58 to check out how clogged my gutters are getting, or even to check for shingle damage after a severe storm; however, the resolution does not lend itself to a great deal of detail. 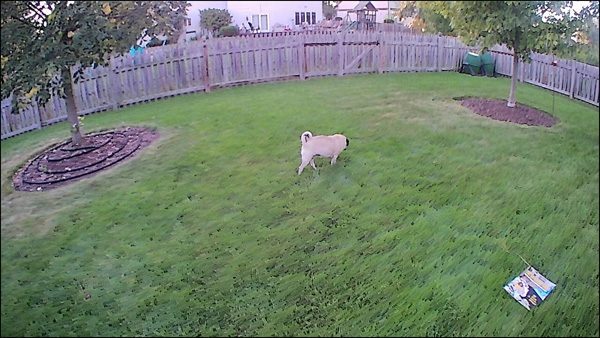 I even followed one of my pugs around the yard with it. (FYI, she didn’t seem to pay much attention, unless I flew really close to her.) I didn’t have the opportunity to fly the E58 in elevated wind conditions, but I did have a few breeze gusts here and there, and it stayed surprisingly stable in these conditions. I was able to get about 8-10 minutes of flight time before the E58’s battery was drained, which it indicated by blinking its lights just before it fully died. However, you could purchase multiple batteries and swap them out for longer flight sessions. 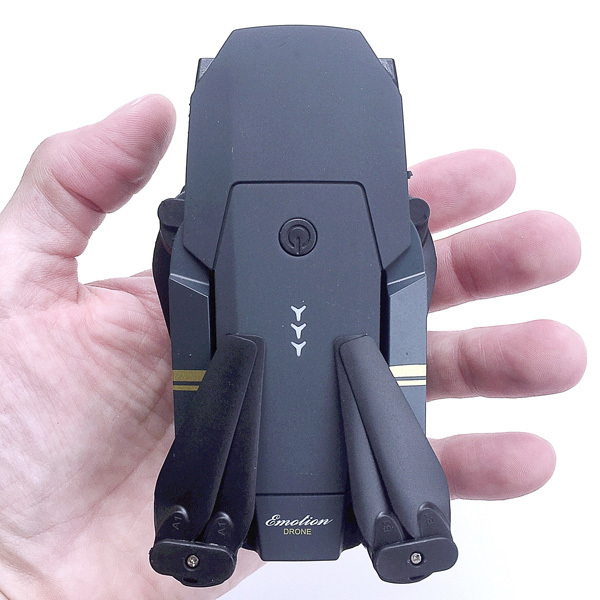 EACHINE E58 RC Pocket Quadcopter Drone is a small, lightweight, miniature drone that has a lot of features, is fairly easy to learn and quite fun to fly once you get the hang of it. 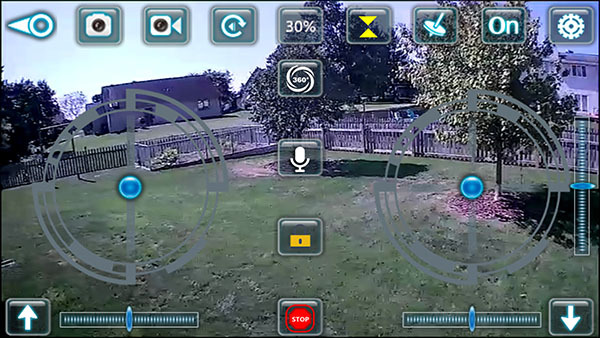 It can also record some decent photos and videos and has multiple options for controlling it. 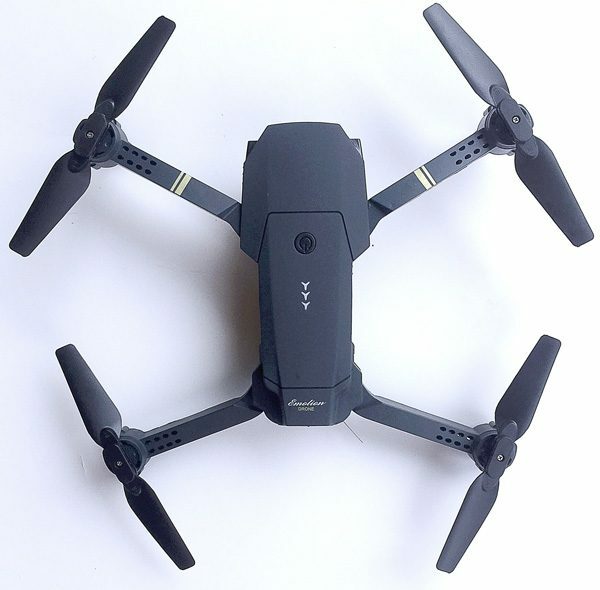 Considering what you actually get with this drone and its “fun factor,” I think it is a pretty decent value for its price of $75.99. 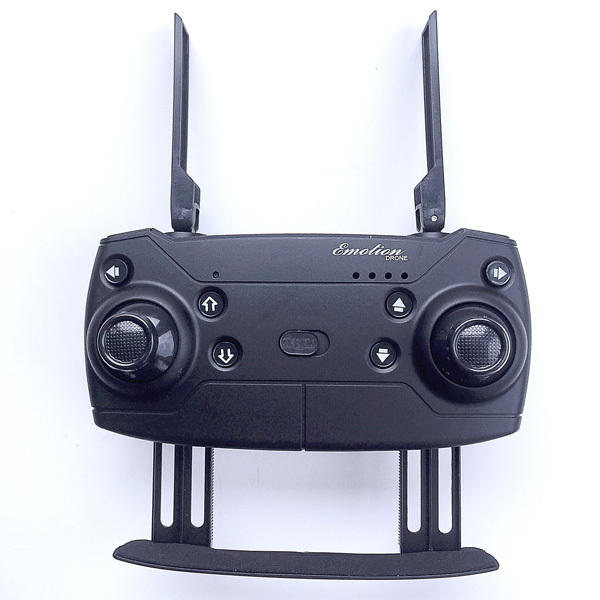 Source: The product sample for this review was provided by Eachine. Very good report, concise and easy read. I have a problem of not finding this “WiFi-720P-DA616D” on my Iphone. the “JY Ufo” part is OK, all I see is my phones WIFY browser connection. What am I doing wrong? “WiFi-720P-DA616D” is the name of the WiFi signal coming from the drone that I saw listed in my iPhone’s list of available WiFi signals. I guessed that this one was correct because it included “720P” which is the resolution of the drone’s video camera. The signal name associated with your drone may be different. Thank you for the kind works, Jerry. I’m glad this review could help you! How do the prop bumpers attach? I was able to slide the bumpers on from the underside of the arms, but you might also be able to carefully slide them on from the front as well. Thxs Andy…. my problem was I didn’t realize that you had to squeeze the plastic posts into the holes on the bottom of the arms. Didn’t want to take a chance of breaking something and again no obvious instructions. I’ve tried charging the battery the red light goes on for about 15 seconds and then shuts off which I assume it means that it’s fully charged but when I plug it in to the drone the drone will not turn on. Any thoughts? 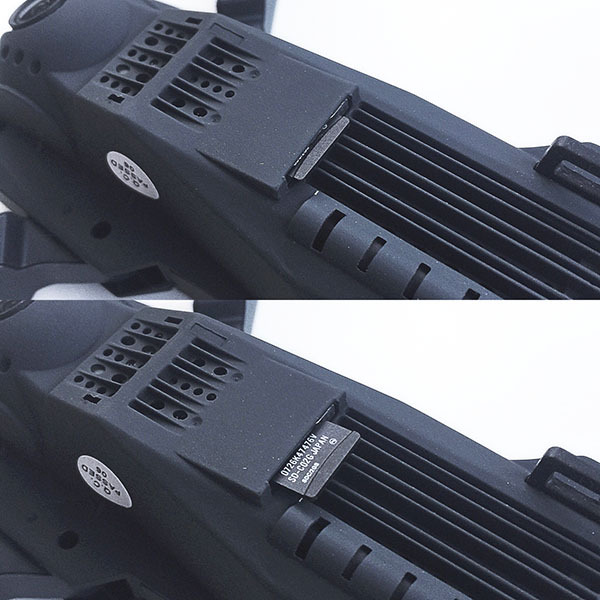 Do you know if the battery once installed is totally flush with the back of the body or does it stick out a tad? I pushed the battery in gently until I felt a bit of a “click” which indicated that it was fully seated in the body of the drone. I think the bar code is just a shortcut to the app, I just down loaded the “JY UFO” app from Google Play Store and it seem to work OK. I think Martin is correct. Im a total novice first drone ,can you please tell me what SD card to buy ,I have SD cards but none of them fit the drone help . Hi Mike you need a micro SD card, you can purchase them with the full sized SD card adaptor, I use the Kingston 64GB class 10 one for less than £10 on Amazon, hope this helps. Martin is 100% correct. 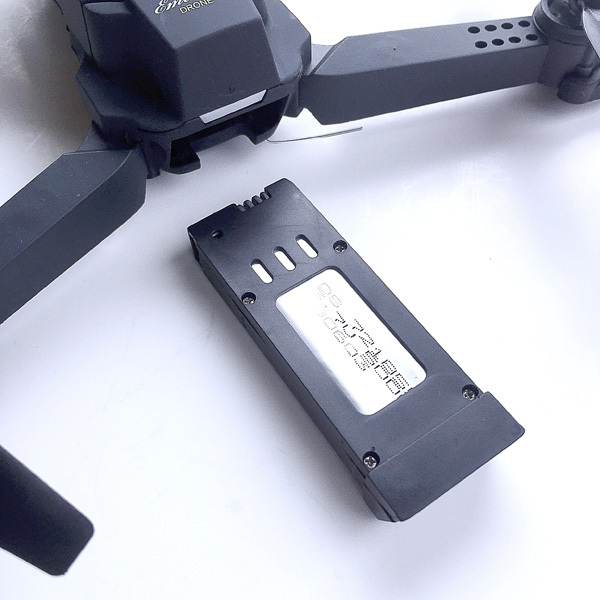 Th E58 drone uses Micro SD cards, not standard-sized SD cards. Thanks for the well written manual, which is lacking with the product. I got this very first drone for Christmas. It’s a good introduction to the technology. 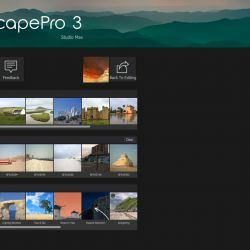 I will add this link to my favourites! I need to spend more time flying and trying things. So far it’s been a tough little drone given my bumps and crashes. I always use the prop guards. I tried a couple flips in doors but crashed it quite violently. Drone was in a stationary flight; I suspect it woulddo better while in a good forward motion. Again, thank you for the great writeup! Henri, thank you for the kinds words and I am happy that this review was helpful to you. 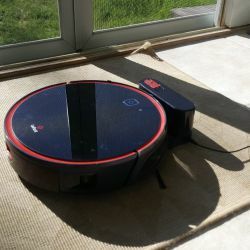 To be fair, our reviews here at The Gadgeteer are typically not intended to be so much as a manual, but a way of highlighting a product’s specs, features, functions and performance so as to give readers an idea of what a product is like. Some reviews are written in more or less detail depending on the product and the writing style and preference of the reviewer, and and the ones written in more detail can indeed seem like a product manual, though that is not our intent. However, we are certainly happy when our reviews are useful to our readers, since that’s why we’re here! Thanks for stopping in, reading our posts, and taking the time to comment! I’ve read that to take photos or videos require you to use both of the upper left buttons of the controller at the same time; i.e. the Photo/Video AND the Headless/Return buttons. However, I haven’t figured out the right combo to make it work. Besides the manual having the normal broken English in it, the writing is very small for my old eyes and required a magnifying glass several times, plus it’s not clear which button they are talking about for the top buttons. The manual just points to the top of the controller, but you can’t tell whether it’s the forward or back button. I had to use try & error to figure it out. I wish I’d seen your review first and it would have helped! Larry, thanks for your feedback and glad that our review could help you. I’m having a problem inserting the micro sd card. to insert but it wont go and I’m not going to force it. Jeff, did you try flipping it over? Not sure what the problem would be other than this. The micro SD card that I used fit into the slot, but I did have to apply a bit of force to overcome some initial resistance in order to click it in place, but I tried to do so VERY carefully. I have the same problem with the sd card. 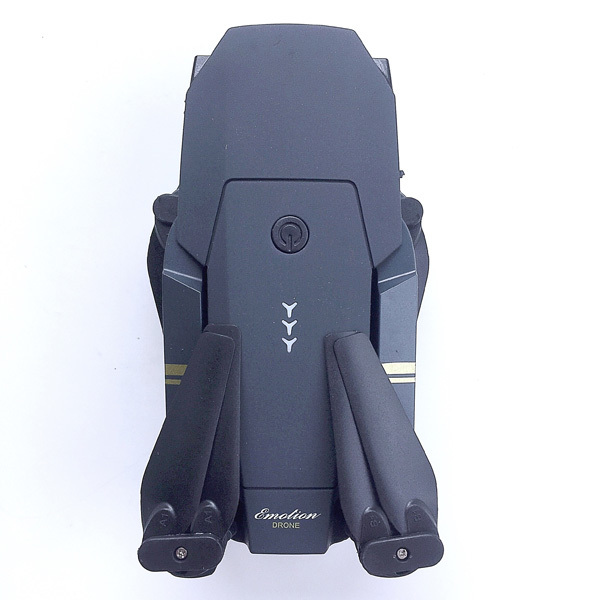 My E58 is sold as drone x pro and it seems that there is also no sd slot. I wanted to use the card because my camera is not communicating with the app, hoping that it would solve that problem. It sounds like there are some knock-offs of this product out there that do not include an actual SD card slot. Jeff, glad that I could be of help. Great review, much better then the chinglish manual. One issue I do have is using the supplied controller. is it possible to save the trim settings as on 1st take-off it reverses at such a rate I cannot trim it before it piles into something! Andy, I’m not aware of such a feature, but it would definitely be handy, as I have a similar issue with the one I reviewed. Hi Andy – great review. I just got this little beast from Amazon. I am unable to power up the a/c from the controller. Just to be sure, I don’t need to use a cell phone and the JY UFO app to take flight, correct? This should operate just like a regular r/c drone, etc… I’ve powered up the handset, then the drone; and vise versa, with no luck. Aside from sending it back, do you have any suggestions? Crash and Burn (great callsign BTW), I believe you are correct–you should not NEED a phone & app to fly the drone, you should be able to control it with the controller by itself. 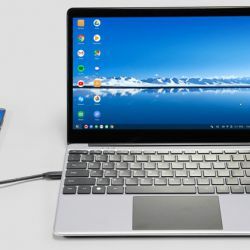 I don’t have any suggestions beyond what you have already tried, other than perhaps pulling out the batteries from each device, then re-inserting them, and also ensuring the batteries have been fully charged. I got all the knowledge I needed to fly the Eachine e58 from the web after reading excellent reviews like yours. The so-called user manual is a bad joke and is not worth the paper it is printed on. I am in correspondence with eBay from where I bought my drone as nowhere did a read on their website that it was necessary to control the drone from a smart phone or tablet, after installing the appropriate app, before it is possible to use the camera in the drone. This is clearly misleading and I wonder whether any of your reviewers feel that they have also been mislead into believing that one of the buttons on the controller does in fact activate the camera. I would welcome any feedback from you. In the meantime thanks for an excellent and very helpful review. Thank you for the kind words, Barry. I agree with all of your comments and sentiments, especially that it is quite misleading that the camera can be activated via the controller. Further to my recent comments regarding the e58 camera, today I had a major “incident”. I had just managed to get the e58 to hover, indoors, with only a slight drifting. Whilst hovering the drone sudden veered off to the right and landed with one propeller spinning at full power. The only way I could stop the propeller was to remove the drone battery. If I replaced the battery the propeller would start again. I am beginning to lose interest and heart! I can empathize, Barrie. I don’t have a lot of drone experience, but I have found this one to be a lot more touchy than I am comfortable with. Piet, I don’t think I can help you here. The E58 drone that I received definitely had a mechanism for “clicking” the micro SD card into and out of the slot. I did push it in very carefully to ensure that I didn’t damage the card or the slot, but it definitely clicked in. You may want to contact either where you bought it from or Eachine to ask for help. Very concise and clear review. It helped me a lot. 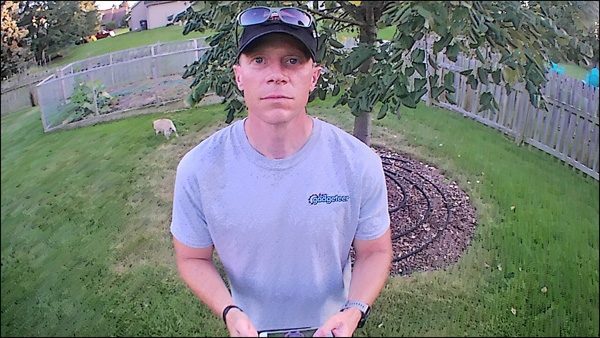 Thank you for sharing your experience with this drone. As I am a rookie drone pilot, have already been able to have some bumps and crashes. The last one, was hard enough to break one of the blade propeller. Looking for it online left me very confused with the “As” and “Bs”, as there are A1, B1, B2, A3, B4. 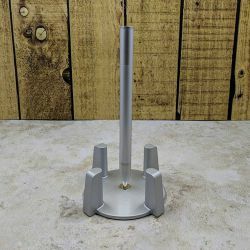 Do you have any tip on the correct set of props blade to buy? I will appreciate your comments on those differences. Apologies, Rafic — I do not have this info. I have not attempted to purchase prop blades. 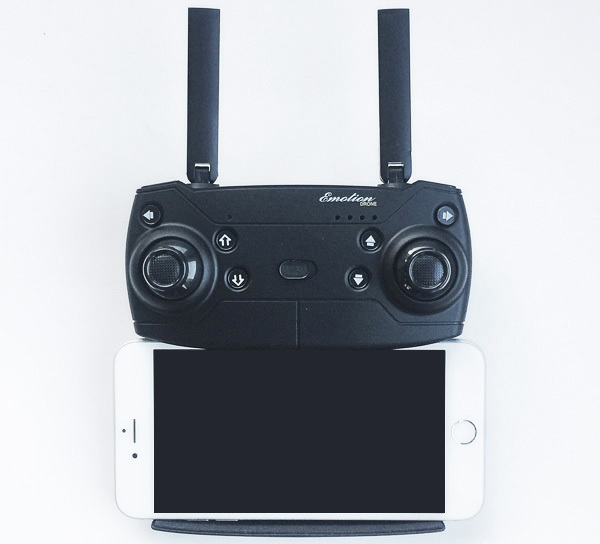 You may want to contact Eachine. I’ve had my E58 for a while now and although I realise it is comparatively cheap, it is good for the price. My only problem is that although I can record video to my iPhone, whatever I do, it will not record to the SD card. When trying to, I get a flashing red dot on the phone screen but if I take the SD card out, I get a flashing timer instead of the red dot. SD card in or out, it still only records to the iPhone. I have tried different cards but still not recording. I’ve not experienced this myself. My only suggestion would be to investigate if your micro SD card is somehow “locked” and prevented from writing to it, or if it perhaps needs to be formatted in some way. Other than those two suggestions, I would suggest contacting EACHINE’s tech support. Gale, I’ve not experienced quite this situation myself, but it sounds like perhaps your drone may need to be recalibrated per the instruction manual. If that doesn’t help, I would suggest contacting EACHINE’s technical support. Andy, thanks for your comments. It looks fun to fly. I have purchased 1 which was bad out of box. Only blue lights come on inside unit. They have since shipped me a 2nd and I now have similar problem it cuts off and on with only blue lights in belly of machine. Any ideas?? Sorry, Joe, I have no suggestions for you. 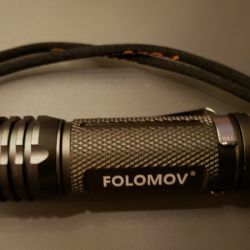 Based on the comments so far, I am starting to think that this product may be of lower quality than I initially thought. I realize that for the money you can’t expect much, but this is a total rip-off. Out from the box, charged batteries and this thing can’t be controlled, does what it wants, have followed all of the calibrating steps and so forth, biggest scam…. By the way, I’m saying all this and I’m an experienced RC aircraft flier and have flown other drones, this takes the cake! Unfortunately, I have to agree with you on this. I’m not the best drone pilot, but this one is quite unstable all on its own. I’m happy that this review could be of some help to you, Jeff. 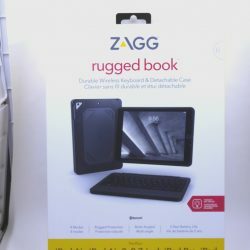 Thanks for stopping by The Gadgeteer and for your kind words. Thanks for your description of the product and how to set it. 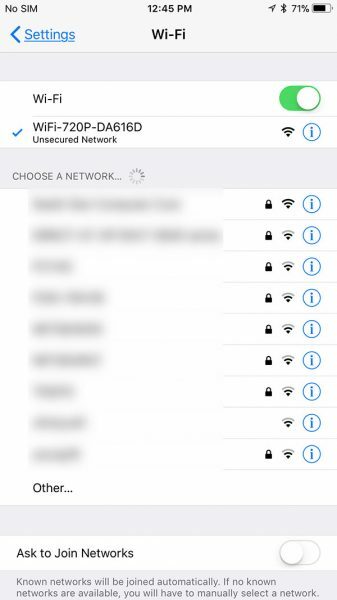 I go as far as founding the WiFi that will make go. However the manual states that once connected I should view what ever the camera is pointing to. Well I have nothing and no matter what I tried the controllers will not make the machine go. I tried to contact the factory but it will not take any writing on the screen???? I don’t think I can help on this; I did not experience the issue you are describing. For those of you that need to have new propeller blades. My machine has the B1, B2 Etc molded on the blade close to the pivot point. Facing the drone the front left has two B1, the front right two A1, the back left two A1 and the back right two B1. I hope this help.